I've noticed over the years that sometimes my travels seem to cluster together visits to certain areas. It's sometimes a deliberate thing, like when I decided that the blank space in my atlas around Merseyside needed attention a few years back - but equally often it seems to be an accident of timing. Thus, I found myself visiting the East Midlands again today just a few days after my last foray here, and only weeks after a very comprehensive covering of the rarer spots on a BLS trip. Oddly, I've only really sped through the area for a long time, having thought I'd exhausted it's possibilities long ago and turned to more exciting pastures. However, with the recent reopening of the Ecclesbourne Valley Railway from Duffield I've started to look at the area with renewed interest. Firstly, it's good to see some fairly comprehensive re-openings in the heritage sector this year after a couple of quiet recession-hit years where preserved railways sat back and hoped that the horribly-named 'staycation' would keep the cash flowing through difficult times. Then rather suddenly after years of promises and lots of effort, Peak Rail make the connection at Matlock within weeks of this line finally reopening over it's full length. This puts the EVR's eight and a half mile line up there alongside the medium-sized outfits in the UK and makes it accessible to a much wider range of punters. Indeed the absolutely crush-loaded Class 153 which did the honours between Derby and Duffield this morning carried a fair few passengers destined for the EVR. With fine weather and still something of a buzz following the opening weekend a couple of weeks back, the railway seemed to be enjoying quite a boom. Booked tickets and then wandered into Duffield to explore a little before the first departure north at 11:10. This was formed of a five-car set of first generation DMU cars. A motley mixture of types and liveries, but all in excellent internal and external condition. Found a seat near the front with a fairly good view out of the driver's window up the dead straight, gently sloping branch. Noted particularly that the railway was tidy - not much in the way of discarded scrap stock lying around like many of these places. The trackbed was clear, and the staff I met were incredibly proud of the place and very friendly indeed. I'm not sure if it was due to the fact the railway was still busy after reopening, or the - well, lets say 'advancing' age of the customers, but there was an incredible amount of moaning about seats. People seemed determined to claim huge amounts of space and when one old chap was denied a seat at the front, he promptly stood blocking everyone's view. I'm used to this sort of thing from steam types, but it was a mild annoyance on what was otherwise and interesting trip up the valley. On arriving at Wirksworth, quickly switched over to a shuttle up the incline to Ravenstor. This short, but incredibly steep run was operated by No.3 a small industrial steam locomotive, and a DMU car. The EVR were running additional services to cope with demand, and we managed to squeeze into one of these for the run up and back. Back at Wirksworth the station was busy with people hoping to board the 12:10 steam service back down the branch. Elected instead to have a wander into the busy little town and a pint in the Red Lion Hotel. Returned to the station, braving the very busy but rather good buffet which was stationed in some very well turned out former-Gatwick Express stock stabled near the platform. Found a seat on the 14:20 back down the branch, despite more silliness from the old-enough-to-know-better bunch about who should be sitting where. A rather sleepy run back down to Duffield in the warm afternoon, with a long week and an early start catching up on me. When we arrived back, quite a crowd was evident at the small station shop and on the platform enjoying the sun. Over the bridge to the mainline station, where a further small crowd was waiting. Mercifully a pristine EMT Class 158 rolled in for the brief journey back to Derby. It's great to see the EVR open for its full length and that plenty of people are keen to visit. With planned passing loops already well underway, there's no reason why a more intensive special event service couldn't run soon - with some very interesting galas possible. Despite the minor irritation of lots of disgruntled pensioners, today was a fine day out on a railway which is very clearly a labour of love for a small group. I'd had a pretty tough week - not in any specific sense, but recovering from Homegame had proved every bit as hard as people had suggested it might. A long, frustrating journey back from Anstruther on Monday had sapped my patience with the modern railway too - where apparently a complaint and refund is preferred over actually using resources to get people home on time at no extra cost. But, like always when I feel hemmed in, up against things, or just generally glum I turn back to the rails for comfort - or indeed just distraction. Today promised plenty of that, as the Great Central Railway and the GCR(N) were hosting a joint diesel gala. These railways, once part of the same wonderfully engineered mainline are geographically separate only by yards. However the project to rejoin them via a bridge over a canal and the Midland Mainline in Loughborough has been a long one. However, as it takes gentle steps nearer to becoming a reality, seeing the railways working together like this is encouraging. The journey up to Leicestershire felt like a breeze after the slog back from Scotland earlier in the week. First train out, time for refreshments at Temple Meads where I continue to revel in the presence of Starbucks. Indeed I was served by my favourite barista this morning, which always brightens my day. Then onto the 07:00 for the sleepy trip into Birmingham. A little slow running around the Lickey Bank though, as a charter train hauled itself up, which was later seen to have 47580 at the helm, veteran of a recent trip to West Wales. A bit of confusion at New Street because I was more concerned with coffee than trains at this point, but eventually onto the 08:52 to Leicester. One final quick change via a cross-platform hop onto a Meridian and we arrived in Loughborough, with the weather still looking pretty fine despite dire warnings. The short walk to Loughborough Central however saw the clouds close in, and as we queued - for what seemed like a long time - the rain began to pelt down in something of a summer storm. The delays seemed to be down to issuing hand-written paper tickets. Not perhaps the best plan for what promised to be a very well attended gala. Eventually onto the platform in time for one of the shuttle services to Rothley Brook, with a motley collection of shunters and a Type 1 in charge. The train left very late indeed, and with the timetable already seemingly going out of the window, we had to re-evaluate what we could realistically do today. My colleagues' priority was covering both lines - while I needed only the short branch into the Heritage Centre on the GCR(N). However, as it looked like the times left us unable to sample the visited Class 56's, I was content just to get a couple of decent long trips with the extensive roster of locos around. After dodging back to Loughborough, D123 did the honours on a full length trip over the line to Leicester North. There was just time for a fill-in move using D1705 out to Quorn and with the disconcertingly yellow 37198 and more traditionally coloured 37275 top and tailing the return. Things seemed to be roughly getting back to time after what appeared to be a failure on the Class 20 hauled service earlier. No time to hang around though, as we needed to get the 13:00 bus to East Leake in order to sample the other section of line. Considering the very small gap separating the two railways, the bus journey was quite long - taking us over the border into Nottinghamshire along the way. East Leake station is still a fairly rudimentary affair, but a shelter is under construction. The GCR(N) is an interesting line given it's fairly unique method of joint operation with Network Rail to service the British Gypsum factory. It's a credit to the operators how they use the line to best advantage despite not having any huge tourist visitors centre or much in the way of ancillary activities besides the trains. What we got was simple - interesting engines and a long run down to Loughborough, stopping just short of the chord which connects to the mainline south of the station. This also afforded an interesting view into Brush Works, where engine testbed 56009 (latterly unofficially dubbed 56201) could be seen. Back to East Leake for a change of traction, before heading north towards Ruddington, and the reverse into the Heritage Centre site. This is a bit of a confusing muddle of stock and buildings, but a station is taking shape in the centre of the chaos. Watched further changes of engine, with veteran of Brighton services 31454 taking charge. A good noisy chug back to Loughborough followed, where we reversed again to head back to East Leake. This was where we had to leave things in order to catch the bus. Not before getting the opportunity to watch splendid looking large-logo 47292 being attached from the loading pad close to the trackside. Back to Loughborough in now pretty steady sunshine for the trip back home, via a refreshment break at Derby where 66101 surprised us by passing on the goods lines. It had been a busy and interesting day, and despite the frustration with the queueing at Loughborough and the slight perturbation which limited what we could do earlier in the day, things had gone pretty well. The bus links worked particularly effectively, and the operation on the GCR(N) was faultless despite some complicated loco manoeuvres. I'm not sure we got best value for the slightly steep rover price of �28, but I think the only realistic way it could have been better used would be to have got digs in the area and gone for the better value weekend ticket. So these two ambitious railways pulled off a first step in their journey towards bridging the gap. I look forward to more of the same in future. I was beginning to feel like I was on a proper holiday. Sleeping uncommonly well, getting up late, lounging around drinking coffee and actually reading and writing are luxuries at the best of times, but to have another day of fantastic music to listen to was of course the clincher. I set out for my morning wander around Anstruther, and found plenty of others doing the same - Homegamers and locals alike seemed keen to stop and chat this morning. Maybe it's because the sun had managed a weak but fairly persistent appearance? In any case, having avoided being too desperately unhealthy so far this weekend, I decided that it was compulsory to visit the Anstruther Fish Bar to find out what the fuss was about. The food was very good indeed, and just like many things which will suffer in comparison after this weekend - it'll be hard to face normal fish and chips again. In fact, in conversation this morning a couple of us had shared the worry that adjusting back to any sort real life after this would be a tricky proposition. I banished these thoughts - after all, I'm a rational creature aren't I? It's just music. Isn't it? I headed to the Erskine Hall early, because it was clearly going to be a busy session given the acts performing this afternoon. I wasn't wrong and the hall, decked out in children's art projects hung on walls painted a queasy yellow, was soon packed for The Pictish Trail. 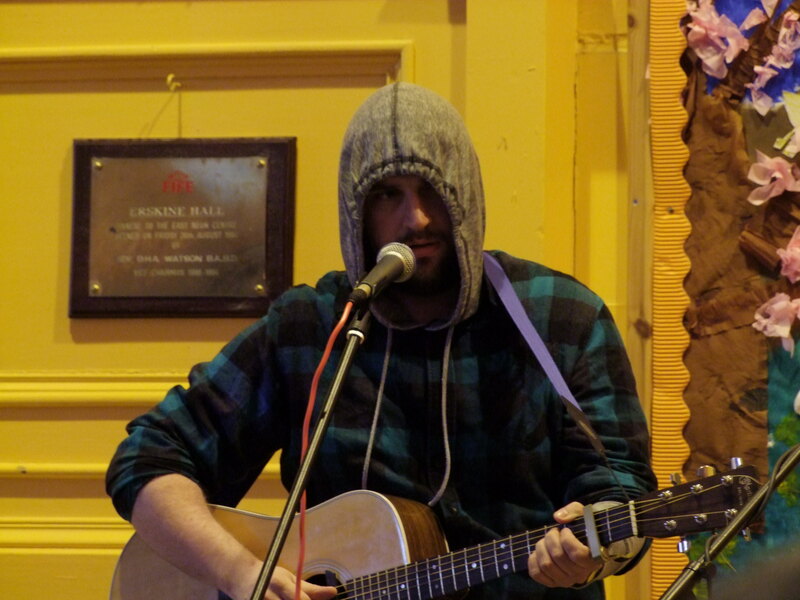 Johnny entered with his hood pulled tightly around his face, nursing the effects of the previous evening, and leaving the small children in the audience in no doubt about the consequences of making noise. Naturally, almost on cue a little one did just that, forming an unlikely comedy duo with Johnny to kick off the set. Unsurprisingly, from the outset The Pictish Trail had the appreciative Homegame audience hooked. The appreciation shown was as much for his efforts in leading the organisation of the event and spending days running around in a blind panic making final preparations - but Johnny wasn't about to let us forget that he can sing and play wonderfully. What is perhaps most remarkable is how effortless he makes it look - just closing his eyes, opening his mouth and letting that high, clear voice soar - despite the after-effects of sugary cider and sleeplessness. This afternoon was all about singer-songwriters, and this short but accomplished set placed The Pictish Trail chief among them today. Rachel Sermanni followed, an unenviable slot in some ways as the audience shuffled around to get to the various competing sessions today. Having heard snippets of Rachel singing in various sessions and radio spots, I was intrigued to see her perform. Most remarkable though in this age of affected cool among younger musicians, was her disarming frankness when talking about her songs and their inspiration. But then she would start to sing, and none of that stuff mattered. Her frankly amazing Highland voice dipping low then soaring high over the hall. I took a quick look around the audience to gauge opinion and found them sitting rapt, staring at Rachel in disbelief. The recordings I'd heard hadn't quite prepared me for hearing her sing live, and all of those sometimes a bit fawning superlatives heaped on her in the press seemed like perhaps they might be appropriate after all. When the set finished, with Rachel clearly touched and humbled by a fantastic reception, there was a collective sigh of approval. Definitely one of the stars of the weekend. All this distracting music left me with a quick dash back to my digs before heading out to Anstruther Town Hall once again. It seems everyone else was a little behind too, as the hall was a little slow to fill as people drifted back from some pretty special afternoon sessions. I relaxed with a pint, wandered around the hall and chatted before taking my treasured spot near the front for This Is The Kit. I'm ashamed to say that despite being based relatively locally to me, I've never caught Kate Stables performing live before. With a band assembled from bits of Fránçois & The Atlas Mountains and Rozi Plain, she skipped through a short set of fairly upbeat numbers drawn from her two albums to date. Again, this performance will drive me back to listen again to records I've neglected with fresh ears, which is never a bad thing. During this set Josh T. Pearson arrived very late indeed, and to the palpable relief of Johnny Lynch who I thought may hug him at one point. However, he's perhaps not the hugging type I thought, as his towering, shadowy presence loomed large behind me at one point while he peered out from backstage to catch the end of This Is The Kit's set. Thus, taking to the stage with no soundcheck due to some complications around his travel from Dublin, Pearson was in no mood for trifling. He stalked the stage, setting things up to his liking - the soundmen showing incredible patience as he tweaked and twiddled with things. However finally he advanced to the front of the stage and began to strum furiously at his guitar. After a little while, this curious noise resolved into "Woman, When I Raise Hell", and that sonorous pain-tinged voice boomed over the guitar notes, by turns delicate and jarring. Given that few of the songs on his recent "Last of the Country Gentlemen" record clock in much below seven minutes, there were some anxious moments around the timing - but surprisingly as he headed for his last song, Pearson found time to joke with the audience. We laughed, with a strange nervous relief rather than genuine amusement. This man has a truly dominant stage presence - and while it was perhaps the only time in the entire weekend that the sense of commonality between performer and audience disappeared, it was an amazing performance. So, with the atmosphere still heavy with the last lingering notes of Josh T. Pearson's final marathon piece, Randolph's Leap literally leapt onto the stage. It was always going to be incredibly hard to follow the previous act, but they managed it by force of sheer lunacy and exuberance. A rapid-fire cascade of songs underpinned by stomping drums, with flickers of violin and some seriously odd sound effects followed. Soon to be released "Counting Sheep" and "Deep Blue Sea" featured alongside filled-out band versions of older favourites like "Crisps" and "Squeamish". I've loved Randolph's Leap for a long time, and to see them in this setting, with an audience happy to dance like idiots to every note they played was a pretty special way to finally see them perform live. But all too soon it was over and we were only one act away from the end of the evening - but that act was Slow Club. It seems like a long time since their "Yeah, So" album stunned me into silence after happening across the band by chance in Crewe of all places, and I've managed to miss them consistently ever since. Tonight, there was plenty of evidence of what they've been up to all this time, with a whole host of new songs aired. These songs were somehow a little darker, a lot louder and Rebecca seemed to have morphed into a Janis Joplin like character, her always flexible voice focused on belting out these new songs alongside the more familiar older material. Suddenly though, something really special was happening. The guitars were unplugged and Charles and Rebecca were at the edge of the stage, singing the rather lovely "Christmas TV" at the top of their voices, accompanied by the audience. It was one of those Homegame moments again. As the last notes faded, Johnny Lynch leapt back on to the stage urging us to "Flee, Flee for the night of our lives...". I did, to Legends in time to catch a short but storming set from FOUND performing much of their recent "Factorycraft" album, with some rarities thrown in for good measure. The Legends audience was a jubilant, feisty and roaringly drunk one, but FOUND ended things on a high for me. My lasting memory of the set will be seeing Johnny Lynch being carried aloft around Legends, surfing a crowd who wouldn't dare drop him after what he and his team of helpers had pulled off this weekend. Earlier on today, Rachel Sermanni said something which struck me enough to jot it down straight away..."This is how it should always be. All the time. Everywhere.". I think that's probably the best summation of things, better than I've managed in reams of wittering about Homegame. There had been a lot of talk about how Homegame affects people, how tough it is to get back to reality after this much fun, indeed this much alcohol. I'd doubted it would affect me, because I'm a fairly thick-skinned old character. But I knew it would - because I knew this would be one of the best weekends I was ever going to have, plain and simple. Considering how last evening ended, I found myself feeling unexpectedly well this morning. I'm not sure if it was the fantastic breakfast supplied at The Waterfront or maybe the bracing sea breeze which whipped along the harbour, but any trace of a lingering hangover soon dissipated. I took advantage of a gap between the showers to head for the churchyard above the Dreel Burn from where I could survey Anstruther and read the papers - not least the enthusiastic reporting of the remarkable SNP election victory. As I read and surveyed, in the distance I could spy little huddles of bleary-eyed Homegamers beginning to appear, stumbling in twos and threes along the harbourfront in search of coffee, breakfast or paracetamol. If I was going to last the day, then I needed a gentle start to proceedings too. So I took a long, slow and circuitous walk to Cellardyke Town Hall for the early afternoon session which was curated by Heavenly Records. I've written before about the reinvention of this stalwart London label as a home for all kinds of new folk music, but the bill that they'd concocted for a lazy afternoon took in a wider sweep than just their own roster. Before I knew it I was nursing a fresh pint of ale and surveying the unlikely venue - a lofty, vaulted hall with all kinds of sailing and fishing memorabilia, a huge saltire prominent on the wall behind the stage. It was clearly going to be an interesting afternoon. Proceedings started with Jack Joseph. Entirely unknown to me, I'm assuming that Jack was one of the two frighteningly young looking gents who took to the stage. One sang and played acoustic guitar, the other embellished the delicate songs with flicks of electric guitar. It was a low-key start, pleasant enough if a little unassuming. I didn't really find out much about Jack Joseph as a result of the performance, and strangely a search of the web afterwards didn't reveal much else beyond his association with Heavenly. As the brief but accomplished set ended the hall began to fill in earnest in preparation for Conquering Animal Sound. It would be utterly embarrassing should I begin to heap any more praise onto this Glasgow-based duo, but once again they coaxed remarkably dense and layered music from their complicated looking collection of technology. Anneke stomped shoeless around the stage, manipulating her own voice while Jamie tested out some rock star poses with his guitar. As ever, the sound was magical - haunting, tense and on a new composition tentatively entitled "Treehouses" strangely menacing too. It was always going to be hard to follow this, and the task fell to Carwyn Ellis of Colorama performing solo. I have to confess I just didn't really warm to these songs - and whilst they were technically impressive with some sparkling guitar playing thrown in there somewhere, the lyrics and the vocals just didn't grab me. Maybe somewhere else, having not had to occupy a stage just vacated by two of the most remarkable performers I'm currently aware of, this might have worked a little better? Heavenly's own Trevor Moss and Hannah-Lou were next on stage, and seeing them preparing to play in front of the collection of nautical memorabilia it struck me how I seem to bump into them in the most unlikely of places - a tin church a few hundred yards from my house, and the sweaty dungeon of The Captain's Rest so far this year already, and we're barely half way through. Once again they huddled around a single microphone and raised the rafters with their strange two-voices-as-one trick. The set mostly consisted of material from their recently finished and soon to be released second album 'Quality First, Last and Forever' - with the trademark cover of Pete Greenwood's "The '88" thrown in for good measure. I'd been curious about how the Homegame audience would react to Trevor and Hannah-Lou's mix of traditional folk styles, but I didn't need to worry, the rapturous reaction to closing "Cheap Wine" confirmed that they'd pulled it off again. I just wonder where I'll end up seeing them next? 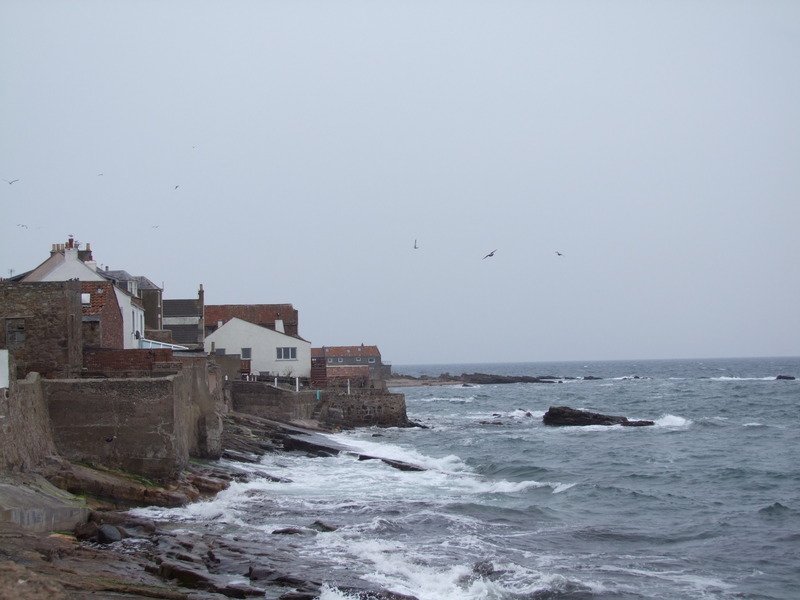 After going in search of food and a wander around town to stretch my strangely tired legs - and hopefully along the way to remember just what I'd done to make them ache like that - I headed for Anstruther Town Hall once again for the evening's entertainment. First up were Geese - another new name to me. Now, many years ago I had a stab at playing the violin. It was an ugly, regrettable incident and is sensibly forgotten. However, tonight Geese showed me I probably hadn't been far off the mark. By turns the duo of violinists sawed at, plucked, sang into and otherwise abused their violins in curious but inventive ways. Backed by a drummer who seemed intent on coaxing nothing short of thunder out of her instruments, the whole thing should have been a fairly taxing listen. But, oddly it wasn't - veering from woozy Cocteau Twins soundscapes to funereal Godspeed, You Black Emperor! marches within the space of just a few extended compositions, I have to confess I was hooked from the outset, and made mental notes to explore further. With my ears still ringing, the stage was set for Cate Le Bon. I'd done some cursory Homegame homework and heard some of Cate's output - what this hadn't prepared me for was the strutting rock queen which she had become as she paced the stage. Borrowing bits of Sweet Baboo to ensure that the Welsh contingent here was represented fully, she managed to grind out a startling range of moods - with her curious voice ranging from a whisper to a shout. I came away from this a little stunned and confused, but certain that I needed to find out more about Cate Le Bon - and I suppose that's part of the Homegame ethic - surely no-one comes away without new names to look up and new music to hunt down? The last time I saw Kid Canaveral was in Bristol, to a paying audience of approximately three of us on a damp and chilly November evening. The band were true professionals that night, and played a proper set despite the disappointing turn out. Tonight was going to be very different indeed, as the hall filled again for their performance. With the addition of former Come On Gang! guitarist Mikey Kid Canaveral sounded huge, ripping into the songs from last year's "Shouting at Wildlife" album - soon to be re-released on Fence - with a new vigour. The audience clearly loved it as the floor of Anstruther Town Hall began to flex in time with the developing moshpit. Let no-one tell you that Homegame is solely about beard-stroking folkniks - not while these frenzied but carefully crafted pop hits are part of it. However, as if to bring us back to our roots, King Creosote himself joined the band in advance of his own performance. Having attended SXSW as his backing band, the fruits of their collaboration were pretty clear - firstly in an accordion drenched but still incendiary take on "Missionary", and then in a new composition with King Creosote on lead vocals which may or may not have been entitled "Home Run". If this performance is anything to go by, there is a ridiculously fine future ahead for Kid Canaveral and scope for more interesting collaboration perhaps? Having been lucky enough to attend one of the "Lancashire Bits of Strange" earlier in the year, I knew the format for the next and much anticipated performance. The Earlies, despite one or two apparent absences from their ranks were still a huge band and barely a corner of the stage of the Town Hall was unfilled. King Creosote entered to his second rapturous reception of the evening. After all, he was very likely the reason many of the people here first heard of Fence, of this place, and indeed of Homegame. Despite the quiet back seat he takes in terms of the organisation of the event, he's an ever present positive force around the place - popping up here and there, reminding us why we made the long trek up to the East Neuk. So as the "Fourteenth Bit of Strange in Fourteen Years" commenced, the full implications of him singing that "...it's only you lot that I'm interested in" were not lost. This collection of songs as interpreted by The Earlies are powerful, varied and easily some of King Creosote's best work to date. With the album played in full, as bonuses we were treated once again to the guitar-tapping version of "Twin Tub Twin" which culminated in a frenzied pogoing conclusion, along with a joyous take on "Bootprints". As we politely filed out of the Town Hall into the mercifully cool evening, there was a sense of having just seen something people would talk about for some time - not least the triumphant performance by Kid Canaveral. The steps of the hall remained busy for some time with people chatting excitedly about this evening, where they were headed next and what was planned for tomorrow - while the Fisher and Donaldson folks packed up their mobile bakery to head for the next venue. For my own part I decided to conserve my energy - and nurse my aching joints. There was another day, packed with music tomorrow - and I intended to last the pace. As I stumbled wearily back to my digs, a bunch of local neds asked me "If I was with the weird bastards from Fence?". I was proud to say I was.